Is ‘girl-centred development’ harmful fantasy? Has the worm finally turned on the promotion of ‘girl-centred development’ in terms of claimed macroeconomic benefits? Daphne Jayasinghe posted on aspects of this yesterday; and the academic literature is pointing the same way. The Journal of International Development has just published a paper by Cynthia Caron and Shelby Margolin, Rescuing Girls, Investing in Girls: A Critique of Development Fantasies. The authors say these programmes support a “development fantasy”, promoting education as a way to “invest in girls” and increase their economic value. The campaigns aim to further economic growth under the guise of girl empowerment, say Caron and Margolin, perpetuating what they see as a “failed development narrative that economic growth inevitably leads to an equitable future for all”. Has the worm turned? Let’s hope so. The need for a genuine focus on women’s empowerment is far too great for it to be pushed down the channel of fantasy. The girl child increasingly is at the centre of development programming. We draw on Slavoj Žižek’s notion of fantasy to show how and, more importantly, why girl-centred initiatives reproduce the shortcomings of women and gender-focused programmes before them. Through an analysis of three girl-centred campaigns, we illustrate how experts identify and diagnose girls’ problems and prescribe solutions that not only circumscribe girls’ futures, but are also counterproductive. We argue that even as campaigns try to integrate lessons learned from earlier gender and development initiatives, the critical reflection that a Žižekian approach promotes would better enable development actors to reformulate campaigns and fundamental campaign assumptions. Girls and women are not an untapped economic resource in the world; their work is the invisible structure that keeps societies and economies together. Too many of the big numbers on gender inequality count the cost for GDP – rather than the costs imposed on women. Daphne Jayasinghe, Women’s Rights Policy Adviser at ActionAid UK, calls time. 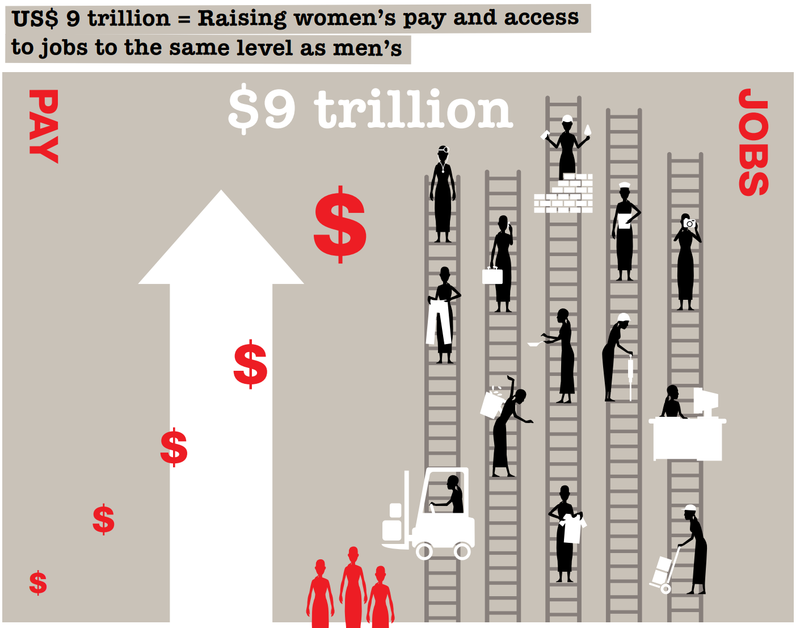 Counting gender inequality – which big numbers? It seems that when it comes to measuring the scale of women’s economic inequality, big numbers really count. Last month the McKinsey Global Institute published its finding that labour market gender inequality represents a $12 tn loss in global GDP. The IMF, the World Economic Forum, the OECD and others have described the “double dividends” of increasing numbers of women in the labour market thereby increasing GDP growth rates . This analysis makes a striking, headline grabbing argument but what is the purpose? In spite of 1 in 3 women suffering violence and a gender pay gap as high as 30% in some countries, it seems that world leaders and decision makers need more convincing on the value of gender equality. The fashion therefore is to promote women’s rights in relation to financial returns to the economy. To highlight the growth potential for economies of more women in the labour market, regardless of the exploitative or dangerous conditions they may be working in. This analysis neglects the fact that neoliberal growth models rely on underpaid women workers as well as a workforce that is fed, clothed and brought up by the invisible cadre of unpaid women carers. Gender inequalities in the home and work place are by no means an inconvenience to global capitalism, they are a precondition for its success. ActionAid took steps to attach a big number to this debate which challenges this contradiction and measures losses to women themselves. We estimate that women globally could be USD$17 trillion better off each year if their pay and access to jobs were equal to that of men (USD$9 trillion in developing countris). We argue that women’s cheap labour and unpaid work is effectively subsidising the economy by this staggering amount – a result of gender discrimination and women’s economic inequality. An analysis of this problem that makes a growth potential argument for gender equality neglects the role that economic policies can play in exacerbating inequalities. An assessment of the benefits of economic justice to women themselves and the economic drivers of inequality is vital. Analysis of the legal gender barriers to the economy exist in the World Bank’s Women, business and the law project. In contrast, an understanding of the underlying but more pervasive social norms governing gender inequality is constrained by data shortages. For example, less than half of all countries measure unpaid care using time-use surveys. The Sustainable Development Goals agreed last month present an opportunity to improve gender data particularly since addressing discriminatory social norms and institutions has become a new development priority and features strongly across the goal on gender (SDG5) targets. Investments in countries’ capacity to gather data and attention to strong indicators to track the progress of achieving goals are imperative. Such a gendered data revolution may help move the debate on women’s economic empowerment along from assessing what women could do for the economy towards what they are already doing – often with little recognition or reward. Ask not what women could do for the economy – ask what they are already doing. The inquest of Connor Sparrowhawk (LB) has closed, with a unanimous jury finding: Connor’s death, as a result of drowning following a seizure in the bath while in a Southern Health treatment and assessment unit, was contributed to by neglect. Connor’s family were originally told he died of natural causes. How far is today’s inquest finding from that? Much more will be heard of the specific failings on the unit, and in particular of the management of Southern Health. So this is far from the end of the road. But it is an important step towards #JusticeforLB – the extraordinary grassroots campaign that has grown up around Connor’s family, Sara and Richard, GeorgeJulian and many others. The consistent and persistent uncounting of people living with learning disabilities is a part of, and a reflection of, one of the greatest systemic injustices internationally. But those statistics, and more often their absence, don’t transmit the full picture. A few of the specifics of Southern Health’s approach, as revealed at the inquest, are worth drawing out. Repeatedly over the course of events, Southern Health ‘found’ new information that should have been provided to Connor’s family previously. Including sending new information unexpectedly, by courier, in the week before the inquest. This, more than two years after Connor’s death, and after numerous internal and independent reviews. At best, the implication is a quite exceptional incompetence in the treatment of vital information about people in their care. In addition, it was only during the inquest that it came to light that a patient had died on the same unit in 2006 – after, almost unbelievably, an epileptic seizure in the bath. The UK government’s attempts to deny legal aid to bereaved families – which have been found in breach of human rights law – rest on the idea that such processes are not adversarial. Connor’s inquest demonstrated beyond any possible doubt the falsity of such a claim. Not only was Southern Health (aggressively) represented, and from the public purse, so too were multiple members of the unit’s then staff, each individually. Not adversarial? What happens when the family don’t have a QC to respond? In September, the United Nations made the commitment to the Sustainable Development Goals (SDGs), which provide a set of targets for human progress for 2016-2030, and importantly apply to every country of the world. Two years and 7 months ago, our gentle, quirky, hilarious and beyond loved son (brother, grandson, nephew, cousin) was admitted to a short term assessment and treatment unit, STATT, run by Southern Health NHS Foundation Trust. Connor, also known as Laughing Boy or LB, loved buses, Eddie Stobart, watching the Mighty Boosh, lying in the sunshine and eating cake. He was 18 years old. The care Connor received in the STATT unit was of an unacceptable standard. The introduction of new medication led to increasing seizure activity on the unit, a fact denied by the consultant psychiatrist for reasons only known to her. Connor was allowed to bathe unsupervised and drowned, 107 days later. Connor’s death was fully preventable. Over the past two weeks we have heard some harrowing accounts of the care provided to Connor. We have also heard some heartfelt apologies and some staff taking responsibility for their actions for which we are grateful. During the inquest, eight legal teams (seven of whom we understand are publicly funded) have examined what happened in minute detail. We have had to fundraise for our legal representation. Since Connor’s death, Southern Health NHS Foundation Trust have consistently tried to duck responsibility, focusing more on their reputation than the intense pain and distress they caused (and continue to cause us). It has been a long and tortuous battle to get this far and even during the inquest, the Trust continued to disclose new information, including the death of another patient in the same bath in 2006. Families should not have to fight for justice and accountability from the NHS. We would like to thank everyone who has supported the campaign for JusticeforLB, and hope that the spotlight that has been shone onto the careless and inhumane treatment of learning disabled people leads to actual (and not just relentlessly talked about) change. It is too late for our beautiful boy but the treatment of learning disabled people more widely should be a matter of national concern. Tax justice, the new Washington consensus? Enter your email address to subscribe to Uncounted and receive notifications of new posts by email.